I promise this is my last post of today!! I've made so many cards this weekend. It's the last real free time I'll have until the Sunday after Thanksgiving and I've been itching to get to some of my new Christmas stamps. I even made a few other projects that I'll share later!! I didn't make this card for any challenge - I just made it for fun. When I saw my friend Barb make a card with this stamp, I thought it was so cute. When I saw it at my local stamp store, I just had to have it (willpower when it comes to stamps is not my thing!) He's called Ginger Joy and he's by Penny Black. Thanks for taking look!! He is hard to resist, isn't he? This is really cute, Donna! Love him with the big stripes! I have been looking for a gingerbread man stamp, he is just too cute! I love your striped background too! hahaha it is difficult to say no to a good craft item! 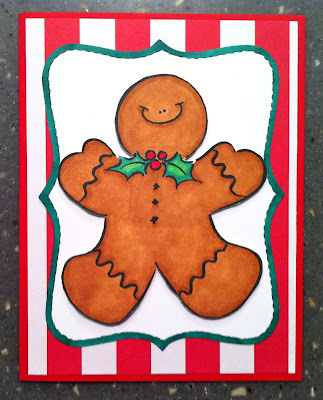 He is very cute, and I like that you made it 'just cuz' :) such a fun happy holiday card! He is a winner! Love the smile and the colors too!